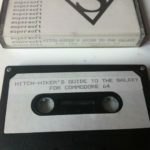 A slightly naughty attempt at cashing in on the Douglas Adams title of the same name, Supersoft didn’t get very far when they were issued with a lawsuit to prevent a proper release of the game. Eventually, the game had all Douglas Adams references taken out or changed to a degree, so that the game could be released as Cosmic Capers. The game itself is a simple text adventure, but we’re not 100% certain if the game was released in a limited form (like Giana Sisters), or if the versions that currently exist in the wild were prototypes. The scans we’ve added here from Retrocollector.org seem to suggest there was a limited release before the game was pulled from shelves. I’ve added Cosmic Capers to the downloads for now, but i’ve been unable to access the original version. Hope to have it added soon.